Watching Michel Gondry's latest film is a religious experience. More specifically, with its insistence on the centrality of memory, it is like going through a Seder. 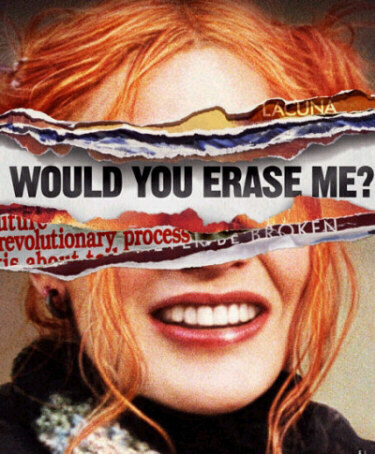 Although Eternal Sunshine of the Spotless Mind uses the ubiquitous Hollywood trope of heterosexual romance, it nevertheless embodies the Seder's injunction to remember the story of our past, teaching how we are constituted by our memories, and how we achieve independence despite, and through, our histories. It even answers a question that the Seder leaves to the imagination: why, when we are celebrating the festival of liberation, are we hemmed in by so many rules. As with the four children in the extremely complex Haggadah, the childish intensity of Joel (Jim Carrey) and Clementine (Kate Winslet) in Gondry's new film should not be confused with childishness on the part of their director. Although Gondry loves to think of himself as a child (his autobiographical film short is called "I've been twelve forever") and his direction displays a childlike delight, his formal sophistication is the key to the complexity of the film. To behave as if you are twelve, but with thirty years of memories, is very different from behaving like a twelve-year old. Nothing is the same the second time around. Memory is the key to understanding, and experience is the basis of independence. Like his "Fell in Love With a Girl" video for The White Stripes, which appears to be filmed entirely using lego in stop-motion animation, Gondry's decision to use the repeated theme of childhood throughout Eternal Sunshine is a measured and adult one. In the music video, the lego-like construction of adolescent love is belied both by the lyrics ("he don't consider it cheating") and the high-tech special effects that trans form digital film into an almost indistinguishable facsimile of the lego models, that is in turn edited into the film of the lego. It is a "childlike" construction enabled by formal complexity - rather like the techniques at the center of Eternal Sunshine itself. The reconstruction of childhood can be escapist (such as in the tedious Look Who's Talking series) but when it is carefully reconstructed in order to engage with it, the revisitation is a form of analysis. Eternal Sunshine, made from a Charlie Kaufman (see related article) screenplay, is about the misplaced yearning for the fresh, clean mental vistas of childhood. The banal villains of the aptly named Lacuna Inc. make their money by removing chunks of unwanted memory from unhappy adults. Using the latest techniques in memory disposal (a machine represented by the actual latest equipment in neuro-surgery, the Leksell Gamma Knife) both Joel and Clementine decide to erase their memories of each other following the end of their two year-long affair. In a twist reminiscent of Romeo and Juliet, Joel decided to erase his memory only upon learning that Clementine had done it, and, halfway through the process, regrets his decision and resists the erasure. Unlike Romeo and Juliet though, Joel and Clementine only kill their past, not their future and, as a consequence, have the opportunity to fight against the erasure for their future together. We see the results of their resistance partly as we watch them unfold in the "real" world but mainly through the straitened vision of Joel's psyche and his projections. The medium of film depends upon memory in a peculiar way. If the film simply spooled through the projector all we would see is a number of blurred images. Yet twenty four times a second the projected frame changes and, to help the illusion of motion, twenty four other times a second the shutter closes and opens again without changing the frame. There is some debate about the exact mental mechanism by which it works, but our ability to see film as a moving narrative relies on a trick of the memory in watching these frames, a trick known as 'persistence of vision.' Everything we see in a film we see twice, and then we see it supplanted, replaced by the next frame as the spool winds off. Unlike photography, seeing film as film depends on the context of what has come before.